You mean I could have an epic purple lanyard of my very own? The folks at Blizzard figure the best way for those of you who aren't able to attend BlizzCon in body to attend in spirit instead, is to hold a BlizzCon in a Box contest. 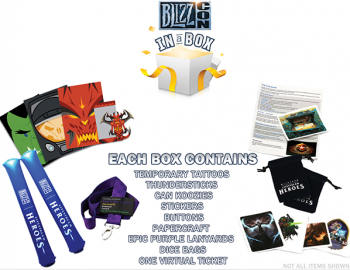 Get yer virtual ticket, yer epic purple lanyard, yer temp tattoos, yer thundersticks ... all you have to do is win a competition at one of Blizzard's participating sites, and you too could get the box of your dreams. The competition is only available to North American residents, and ends October 28th, so if you think this is for you, better hurry. What do you have to do to get one? Well, it's up to the participating site. BlizzPro, for example, has little paper masks it wants you to wear. Take a picture of you in a mask, with a couple sentences explaining why you're the best pick, and send it to BlizzPro. MMO Champion wants a screenshot of you and your buddies in-game yelling "BlizzCon"! And so forth. BlizzCon, the gift that keeps on giving, now in handy dandy box form, for a party of one. Probably the best item in the pack is the virtual ticket, which will include all of the virtual items normally only given to Con attendees. Go nuts! Rub on a temp tattoo! You'll be glad you did.